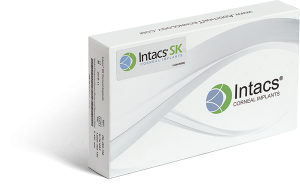 Product description Intacs®SK intracorneal implants are rounded segments designed to implant in the corneal stromal with a small radial incision, in order to reduce halos and other undesired visual effects. Sterilization method Ethylene Oxide (ETO). Supply Sterile, single or double units, depending on the reference requested (see table).